Each heading represents an argument Gene Miller addresses. Miller responds: Paul would be unlikely to use an ambiguous term (archai) that could mean either human or demonic authorities to indicate “elemental spirits”. Comment: Such an assertion needs to be accompanied by a justification. In Rom 13:1-7 Paul considers the Roman authorities to be “a providential and beneficent power” so he would not in 1 Cor 2:6-8 accuse them of being ignorant and crucifying Jesus. Miller responds: Paul’s view of Roman authorities is irrelevant since he believed it was the Jewish authorities who were responsible for crucifying Jesus. In support Miller cites Acts 13:27-29 and 1 Thes 2:14-15. Comment: The author of Acts elsewhere portrays a view of Paul that is in stark contrast to the Paul of the letters. That author known as Luke appears to have been creating a Paul more suited to the “orthodoxy” of his day. The passage in 1 Thessalonians 2 is of very doubtful authenticity according to a number of scholars so cannot be relied upon as a sound basis for an argument. I Cor 2:6 says the “rulers of this age” have a certain kind of wisdom, implying in a sense that they are more than human. Miller responds: In this context, Paul has been speaking only of human wisdom. Ergo, the rulers of this age have a human wisdom and are therefore human. Compare 1:19, 20 where Paul speaks of the wise person, the scribe or teacher, the philosopher of this world. I also have a question about Paul’s double expression, “wisdom of this age OR of the rulers of this age”. The former phrase, wisdom of this age, certainly follows the previous discussion of wisdom among the wise men of the world but what do we make of Paul adding “or of the rulers of this age”? If he has already covered the wise and noble of this world who know only the “wisdom of this age” then why introduce “rulers of this age” as if they are an afterthought or an extra to be brought in at this point? If he has been talking about those nobly born, the philosophers, etc, then why not simply say that those same people crucified “the lord of glory”? Rather, one might find here room for an alternative interpretation of those who rule over this age with its mighty, noble, wise, philosophers, etc. Thus far I think it is a mistake to be dogmatic about rulers being a reference to earthly kings. 1 Cor 2:8 says that if the “rulers of this age” knew the “wisdom of God” they would not have crucified the lord of glory. Demonic powers would fit such a description since they were ignorant of both the plan of God and identity of Jesus (e.g. In both the Ascension of Isaiah and a writing of Ignatius we find that the angelic powers were indeed unaware of both the plan of God and the identity of Jesus. Miller responds: The Gospel records clearly says that the demons did indeed recognize Jesus as “the Holy One of God and “the Son of God. Throughout Acts (3:17, 13:27) we also read that the human rulers were ignorant of both the plan of God and identity of Jesus and that is why they crucified him. Comment: Again, the question is what Paul meant. Turning to significantly later texts that in some cases present a very different picture of Paul from the one we know in his letters will tell us what later persons believed or wanted others to believe, not what Paul himself meant. Many commentators have pointed out that both Jewish and Hellenistic beliefs of the day held that supernatural powers lay behind the human world and its rulers (e.g. Pilate, Herod, Caiaphas). Some have connected this concept with gnostic views that were thought to be prevalent at the time. Miller responds: Even if some Jewish leaders were in ignorance of God’s plan and crucified Jesus, Paul would never have thought of the Jewish leaders as being under the say of demonic powers. Further, Miller notes that the rulers of 1 Cor 2:6-8 are not said to have any power over “the human soul”, are not said to be intrinsically evil in nature, are not said to have any spiritual power over humankind. Therefore we cannot think Paul is speaking of demons. Comment: Miller is effectively saying that if Paul had written much more to explain in detail who he meant by “rulers of this age” then we would not be having this discussion. True enough, but beside the point. 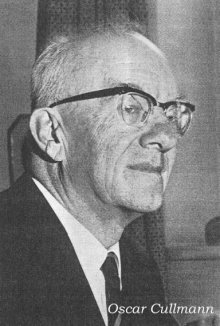 Many scholars have followed Oscar Cullmann’s argument The State in the New Testament (1956) that in 1 Cor. 2:6-8 Paul understands the “rulers of this age” to include both spiritual and human powers. Cullmann argued that we are to understand the passage implying that the demonic powers stood behind the earthly powers, influencing them. In the course of his discussion, Cullmann points out that Paul, on many occasions and probably always, uses the term exousiai to refer to supernatural powers. This makes it more likely than ever that Paul in this passage refers only to human authorities. Comment: Again, the gospels and Acts are often at odds with the content of Paul’s letters and, being written after the time of Paul, cannot be used as a guide to what Paul himself originally understood. As for the second point Miller makes of Cullmann’s discussion, it is apparent that he has in fact misread Cullmann. Cullmann’s discussion centres around Romans 13:1-7 where Paul uses the word exousiai to refer to the earthly state power of Rome. Cullmann’s whole argument depends upon Paul understanding that the word can and does apply to both spiritual as well as human authorities. In other words, the Greek words for “powers” and “rulers” could be, and were, used for authorities in general and it was the context indicated whether they were spiritual or human. I have failed to find a single passage in St. Paul’s writings where ‘demonic forces’ as opposed to ‘personal’ demons are referred to which does not say either (1) that these forces have been overcome or (2) that they will be overcome or (3) that they are something which the Christian ought to have ‘grown out of’, apart from Col. i. 16, which makes it clear that all these powers were created through Christ and for Him. That a victory has already been achieved is made clear in Gal. i. 3-4. Our Lord Jesus Christ, who sacrificed himself for our sins, to rescue us out of this present age of wickedness,’ if we are correct in seeing here a reference to demonic forces at all. No such doubt arises with Gal. iv. 3f, ‘During our minority we were slaves to the elemental spirits of the universe but. . . God sent his own son .. . to purchase freedom for the subjects of the law’. The thought is continued in Gal. iv. 8. We read in Col. i. 13, ‘He rescued us from the domain of darkness and brought us away into the kingdom of his dear Son, in whom our release (apolutrosis, sometimes rendered “redemption”) is secured,’ in Col. ii. 15, On that cross he discarded the cosmic powers and authorities like a garment,’ and in Col. ii. 20, ‘Did you not die with Christ and pass beyond reach of the elemental spirits of the world?’ These passages have been quoted in full to underline the obvious, but supremely important fact that the victory already achieved over the forces of evil is closely bound up with the cross of Christ. This past victory on the part of Christ has moral and spiritual repercussions for those who are Christians; in view of Christ’s victory, asks St. Paul in Gal. iv. 9, ‘How can you turn back to the mean and beggarly spirits of the elements?’ The same sentiment is repeated in Col. ii. 8, 18. The ‘past’ victory is stressed, without reference to the cross, at Eph. i. 20-23 (where the resurrection is mentioned), ii. 1-2 and iii. 10-12. A further victory by Christians through Christ’s power, over evil spirits is the theme of Eph. vi. 10-19. Cullmann, O., 1956. The State in the New Testament. Charles Scribner’s Sons, New York. Miller, G., 1972. “ΑΡΧΟΝΤΩΝ ΤΟΥ ΑΙΩΝΟΣ ΤΟΥΤΟΥ — A New Look at 1 Corinthians 2:6-8.” Journal of Biblical Literature 91, 522–528. Whiteley, D.E.H., 1964. The Theology of St. Paul. Blackwell, Oxford. Posted on 2018-06-20 06:03:34 GMT+0000 by Neil Godfrey. This entry was posted in Paul and His Letters and tagged Jesus' Crucifixion, Rulers of this age. Bookmark the permalink. I believe that this whole debate exist cause we do not consider the similarities between Jewish laws and Athenian laws and in extend the Roman laws. Gmirkin’s “Plato and the Creation of the Hebrew Bible” settled this. Even if someone do not agree with Gmirkin’s point of view, that the writers of the O.T. used the Athenian and Platonic laws, the fact of the similarities cannot be denied. Romans 13:1-7 makes this fact clear. In general Romans is all about this, how god passed the wisdom and how this wisdom was transformed by people cause they had no faith to him. So in the end seems like that we misunderstood Paul’s misunderstanding. And we created demons in this case.